Tourism Ireland CEO, Niall Gibbons, and Peter Baumgartner, CEO of Etihad Airways, announce the incentive to over 60 travel agents at Sofitel Abu Dhabi Corniche. 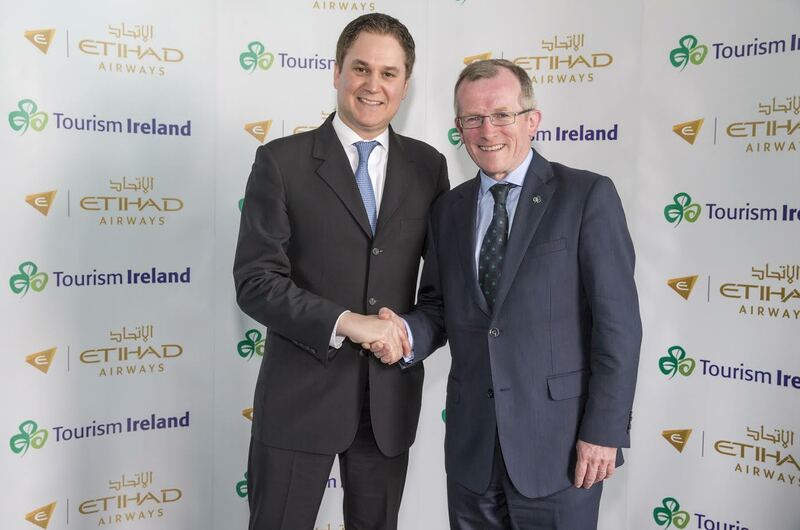 Abu Dhabi, UAE: Tourism Ireland CEO, Niall Gibbons, and Peter Baumgartner, CEO of Etihad Airways, have launched the Etihad Airways and Tourism Ireland trade incentive during the Abu Dhabi roadshow event at Sofitel, Abu Dhabi Corniche. The travel trade incentive, which is part of the Etihad Airways SuperSeller programme, encourages agents to sell flights and holiday packages to the island of Ireland. The two top sellers of Ireland will be rewarded with return flight tickets to Dublin to experience the destination first hand. Peter Baumgartner, Chief Executive Officer of Etihad Airways, said: “We greatly value our relationship with Tourism Ireland. This partnership helps develop our services to the Irish market for the benefit of millions of travellers who are keen to explore everything that the island of Ireland has to offer. The airline has strong links with Ireland and is the sponsor of the GAA Hurling All Ireland Senior Championship and the Etihad Skyline at Croke Park. The airline operates a premium lounge in Terminal 2 and an engineering facility from Dublin Airport. In 2015, we welcomed more than 8.6 million overseas visitors to Ireland, delivering revenue of about €4.2 billion. Etihad Aviation Group (EAG) is a diversified global aviation and travel group comprising four business divisions – Etihad Airways, the national airline of the United Arab Emirates, Etihad Engineering, Hala Group and Airline Equity Partners. The group has minority investments in seven airlines: airberlin, Air Serbia, Air Seychelles, Alitalia, Jet Airways, Virgin Australia, and Swiss-based Darwin Airline, trading as Etihad Regional. From its Abu Dhabi base, Etihad Airways flies to, or has announced plans to serve, 117 passenger and cargo destinations in the Middle East, Africa, Europe, Asia, Australia and the Americas. The airline has a fleet of 122 Airbus and Boeing aircraft, with 204 aircraft on firm order, including 71 Boeing 787s, 25 Boeing 777Xs, 62 Airbus A350s and 10 Airbus A380s.